When a coronally loose #10 K-file won’t slide the last couple of millimeters to patency, as seen in the WL radiograph, it is almost never due to an apically calcified canal. If a hard, abrupt impediment is felt, it will either be the outer wall of a curve or an apical split. DB roots of maxillary molars are notorious for apical dilacerations to the distal. In this case, the file is hitting against the outer wall of the apical curve in the WL radiograph. 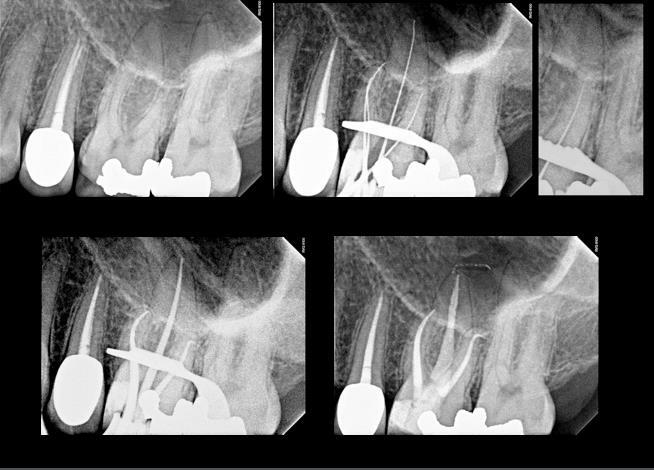 Patency was achieved with a pre-bent #6 K-file (UR rad, squint), and the shape was completed with hand files, including a pre-bent GT 20-06 rotary hand file. A pre-bent master cone was fit to length and obturation was completed.